He was live with this exactly one hour ago. We haven’t even finished watching the 8 minute video, but we thought you should know about it. Our initial impression a few minutes into it is that this guy seems very uptight and nervous for someone supposedly so ‘accomplished’. Whatever could be the reason why. 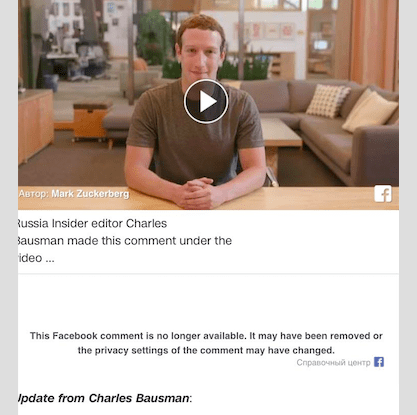 Update #2 from Charles Bausman:Hmmm my update #1 seems to have been on target, fans are writing in telling me my comment is blocked on iphones, although I can still see it on my android phone, and on this page, but it isnt clickable. Well, good thing I took a screen shot – we’ll just keep it here in case the original does go down … Now read my update below – folks we have to do something about these people – who asked them to tell us what we can and cannot think? I wonder if ‘moron’ was politically insensitive to, well – morons? -, like Zuckerberg? Geez that guy is cucky. 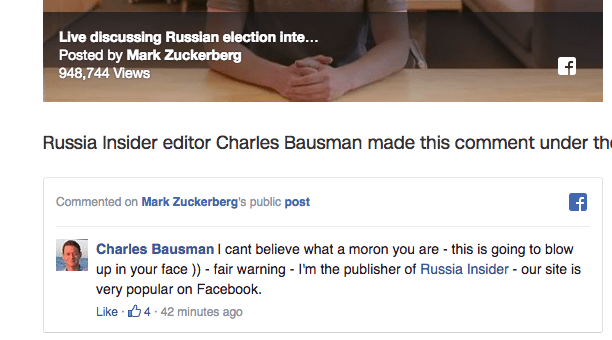 We’ve been sounding the alarm at Russia Insider about this encroaching censorship – which is very, very real. Out videos get blocked on YT, Google artificially lowers our searches and won’t include us in ‘Google News’, we are shadow-banned on Twitter. The need to regulate and rein-in these modern day robber-barons is well upon us, and RI is going to be making this a major theme going into the Fall season. If you haven’t yet, please support our Fall fund drive – when the truth is on your side, it really doesn’t take much resources to expose these people for what they are. We already have them on the run – that is why they are pulling these moves. As long as we hold firm, this will not save them! Posted on September 30, 2017, in ConspiracyOz Posts. Bookmark the permalink. 1 Comment.